I came across this quiz on Doree Weller’s blog and thought it would make for a fun post. I’m often asked questions about my reading habits and preferences, so here you go! 1. Do you have a certain place at home for reading? My bed, or the love seat in my office are my favorite spots but I’ll read anywhere! 3. 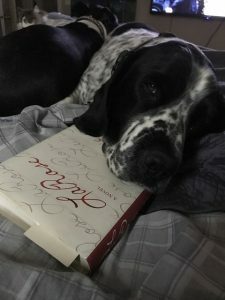 Can you just stop reading or do you have to stop after a chapter? I can stop anywhere. 4. Do you eat or drink while reading? Every day! 5. Multitasking: Music or TV while reading? Nope. Maybe music without lyrics but I prefer quiet time for reading. 6. One book at a time or several at once? I always have several going, in different formats and from different genres. 7. Reading at home or everywhere? Everywhere! I try to always have a book with me, and listen to audio books all the time while I’m driving or out walking. 8. Reading out loud or silently in your head? Silently, although occasionally I’ll read a particularly funny or interesting passage out loud to my husband. 9. Do you read ahead or skip pages? No way! 10. Breaking the spine or keeping it like new? I don’t intentionally break the spines. 11. Do you write in your books? Yes, mostly in non-fiction books. I’m a huge fan of page tabs. 1. When do you find yourself reading? Morning, afternoon, evening, when you get a chance or all the time? Any time I get a chance, but I love reading in the evenings before bed. 2. 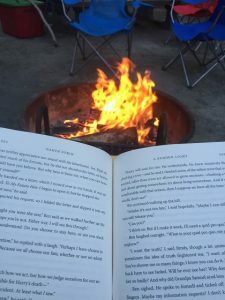 What is your best setting to read in? Any quiet one. 3. What do you do first – Read or Watch? Read for sure. 4. What form do you prefer? Audio book, ebook, or physical book? I prefer a physical book, but I love audio books, and ebooks are convenient. 5. Do you have a unique habit when you read? Once I’m about 100 pages in, I’ll look ahead to see how many pages there are total so I can count down to finishing. 6. Do book series have to match? Covers/editions don’t have to, but if I’m listening to a series on audio book, I need to have the same narrator for each one! What do you think of my reading habits? Do have any other questions you’d like me to answer? What are your reading habits like?